The long-term effects of a spinal cord injury can impact a person’s ability to work and perform daily tasks. Additionally, when paralysis is the result of spinal cord injury, medical complications associated with immobility create serious health risks that aren’t easily prevented or treated. 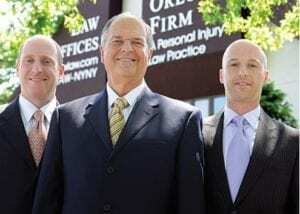 At the personal injury law office of The Orlow Firm, our attorneys help people suffering from spinal cord injuries recover compensation proportional to the total impact of their injury. Working with medical experts, economists, and physical therapists, we take into consideration costs associated with future surgery, rehabilitation, medical equipment, lost wages, and loss in quality of life. If the spinal cord fractures, severing the nerves that run along its column to the brain, paralysis can occur. In each instance, the effects of a spinal cord injury impacts a person’s mobility and, in some cases, bodily functions. As a result, long-term health care is almost always needed, including in-home nursing care, medical equipment, and rehabilitation. In low impact car accidents and serious slips and falls, fractured vertebrae are common. Even though the spinal cord is not severed, a fractured vertebra can lead to numbness and weakness in the extremities, loss of bladder control, and chronic pain. As a result, a person may find it difficult to work, lift objects, or perform certain daily tasks. While not as serious as paraplegia or quadriplegia, fractured vertebrae can still result in disability and a lifelong need for ongoing medical care. To learn how you can recover damages in a spinal cord injury case, contact The Orlow Firm today. Regardless of whether you were injured in a car accident or a work-related injury, we have the experience and investigative resources needed to help you. Our attorneys can also discuss the advantages of establishing a special needs trust or a structured settlement with any proceeds from your case. This is especially important in cases involving children or injured spouses. To schedule a free consultation to discuss your case, contact the Brooklyn spinal cord injury attorneys at The Orlow Firm today by calling (646) 647-3398 or sending us a message online.